My lawn mower is a Toro Wheelhorse 312-8 its a small garden tractor with a 12 hp cast iron fan cooled Kohler engine belt driven to a dual range 3 speed w/ reverse gearbox for a total of 8 gears. The tractor was purchased brand new in 1984 with a recycling deck and a small pull cart. for the first 8 years of its life it was used to move yard waste and mowed a 1/2 acre lot every week all summer and was stored winters although i have heard good things about the available snow blower I've always had access to a plow truck. for the last 16 years its mowed 1 1/2 acres of varying terrain. the deck was a 3 blade 42" wide model. the reason for the recycler deck is i don't like to rake grass and it helps keep the lawn fertilized. as long as i didn't let the lawn go to long the deck always cut clean and straight. the desk is attached with toros attach-o-matic system that requires no tools. After the first couple times you take it off and on it takes maybe 5 minutes to remove or install for cleaning or sharping. every spring i changed the oil and replaced the air filter . along the way i've installed a small clear fuel filter and replaced the gas line from the tank to the carb. also the rubber grommet that seals the petcock to the fuel tank had gotten brittle and dry so i replaced that as well. Its worn out one drive belt and one mower belt. and about 10 years ago the deck was rotting around were the blade attach so i picked up a used side discharge deck for $150 the pto clutch has always worked smoothly and never slipped. after backing into a couple shrubs the taillight cover and bulbs were broken and never replaced but the headlights still have the factory bulbs and work great i once had to replace the main fuse and it has a new battery. a few years ago i removed and rebuilt the carb and just this year the muffler gave out and was replaced the engine has always ran flawlessly and started with just a few turns. in the past 24 years my I've seen my neighbors go threw 4 or 5 mowers each but my wheel horse still works today like the day i bought it. along the way its worn out a few parts but over all for the 500 or so in parts plus the high initial price to buy it I feel it was well worth it, and would recommend to anyone to buy a wheelhorse mower. With a little tlc it will probably be the only lawnmower you ever buy. I bought my 312 8. in 1984 in CT and cut 1a of grass and plowed Snow on a hilly driveway. I moved to NC. in 1995 and have cut grass. I only replaced the air filter and changed the oil and mower belt when it needed it. The mower was kept in a closed shed and looks new even today. It is the best investment you can make when buying lawn equipment. When buying a riding lawn tractor, you tell yourself that it will last for many years and that it's worth investing the $$. Well, I purchased my 321-8 in 1990 and use it year round for mowing, plowing, picking up yard waste, and hauling firewood. I'm still on the original drive belt, and aside of yearly oil changes, air filter and the occasional spark plug, and greasing, the only thing I've replaced (three times) is the mower deck drive belt. The engine runs strong, doesn't use oil, and is totally reliable. It's the best product ....hands down ....that I've ever purchased and used for more years than I expected. We bought our 312-8 in 1996 and didn't have a blade of grass.... I have mowed my lawn and other lawns just so I could mow with this tractor. I wouldn't trade it for nothing. I have owned a 310-8 for ten years,got it used and put liquidweighted ag tires and weights on it and a dozer blade. I filled in a pond with no problem,put a set of rings in it last year and it needs a new muffler this year. I also own another 310-8 and a 312-8 for about a year now. I will never own any other tractor but a wheelhorse. I have a 48" side discharge deck on my later 310-8 and am looking for a tiller for my 312-8. I bought my 312-8 twelve years ago. I have put this tractor through a lot. I just used it last fall to cut four acres of brush. It takes anything i can throw at it. There isn't a tractor out there i would trade it for! Just got one 2 years ago and just lost the mower belt. Any one know the belkt size off the top of their head?? I have one it is a 1990 and has never fiailed to start. been through one mower deck, my fault for not cleaning it, bought a new pan and changed over all the original parts, I did install new bearings and seals while it was apart but none were bad. I hve used it to grade dirt and mow my 1.5 acre lawn for 21 years as far as I'm concered its one of the best lawn tractors ever made. Both my brothers have been through two John Deeres since I bought this one, they did buy the smaller units(cheapskates)and I still tease them about it "nothing runs like a deer but nothing works like a Horse" My dad bought a 22 horse and a blower. That baby will really toss the snow. I just replaced the idler mule "V" pulley. and the muffler Cheap repair for 21 years of service. I would like to pick up another one and put a snow blower on it. I have a 86 312-8 and cut 1.5 acs. for 10 years along with plowing snow on a steep driveway in Ct. Now I live in North Carolina and cut only 1/3 of an ac. and my Wheel Horse is still in like new condition. I have only replaced the rear tires and the seat along with mower belts and blades but she still runs great. I change the oil and air filter often and keep it parked indoors. This tractor was worth every penny I paid for it. Hello folks I would like to find out some info on my mower deck,A pic would be great but just info will be a help.It is a side discharge.It is a hemming deck.Not sure what size,I think 38 or 40 in.Shouldn't matter.Its seems to be in good shape considering.Needs one small patch.What I need to know is what the shields underneath are like.There a three blades .Most of the center shield is there but the two side ones are missing.I am wondering if those shields go up against the deck and if not how far down from the deck they are.I can see where they were fastened on the back of the deck but dont see where they were fastened to the top of the deck.Any help would be appreciated. The Wheel Horse is the greatest small tractor ever built. I bought mine in 1973 (Kohler 8 HP engine)replaced rings once added carburetor kit - never ever anything else. Today it runs as good as when I bought it. In addition To the mower deck I have a plow which I use mostly for cleaning backyard and garden. Why was it discontinued and why is it that no one can build a tractor like my 1973 WHEEL HORSE. I am trying to locate deck parts for my 1989 model. Never had any problems but now need to replace some parts and can't seem to locate a diagram of the deck as I do not have a parts diagram. Any help would be greatly appreciated. i have a 312-8 wheel horse who has in front 2 pulleys where the belt is mounting on coming from clutch to mower deck and they are mounted on a part wich can tie or untie the belt. we have one and also love it. our biggest challenge right now is finding a replacement deck. any ideas? I just bought a Wheel Horse 312-8 mower and was amazed that it stated at all. This mower sat in my neighbors back yard through rain and snow for a whole year without a cover on it. All I had to do was charge the battery and put new gas in it. Pulled the choke and turned the key. Wouldn't you know it started right up. Now I am a believer that the Wheel Horse \ Big Red is the best riding mower ever made. Now I have a mower for another 10 to 20 years. I thank my friend for that. I have owed my wheel horse tractor now for 12 years. In all that time, I have never had one problem with it. Wheel Horse. Best tractor ever built! Old red is a 312-8. I had the 312-8 since 1985 bought it from the dealer as it was thier shop demo unit. I had the rear discharge deck and purchased the 42" dozer blade. All I can say is it is still running today. I sold it when I moved 8 years ago to my neighbor. I mowed 2.5 acres of grass for 11 years then moved to VA with a smaller yard of 1.5 acres of grass. Additionally I plowed my driveway in Up State NY and after moving to VA a 1/4 mile road of snow for 4 years and driveways all winter. The thing is a beast and I sold it to get a larger model just because. It is currently only mowing 1.5 acres of grass now for my old neighboe because I kept the blade for the newer unit. This is one of the best riding tractors mowers ever made and after 25 years in use it will out last any new one out there now. 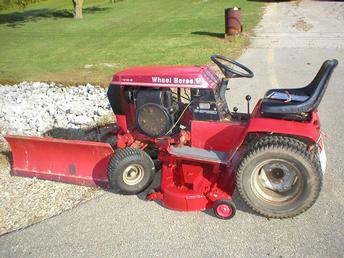 My Wheelhorse 312-8 "Old Red"
I bought mine new in 1989. It has about 450 hours on it. Unfortunatly it has been sitting in a barn for about three years now (bought a zero turn mower), and this Spring I have decided to put in a fresh battery and whatever else it needs to be brought back to life. It has the 48inch mnower deck, and also the rear mounted tiller attachment. The Kohler 12hp motor has an amazing amount of torque for its size. I give my old 312-8 a 5+ star rating. 25 years and still works like a horse! I have two 1985 312-8 machines , i leave the snowplow and weights and chains on the one , and the rear discharge mower on the other .These little tractors do a great job and they are easy to maintain Dave in kalkaska mi. I've owned my 312-8 for 21 years. I've worn out 1 deck. I have a small business & I use the rototiller during the spring. These things are true workhorses. I will always be a Wheel horse junkie.